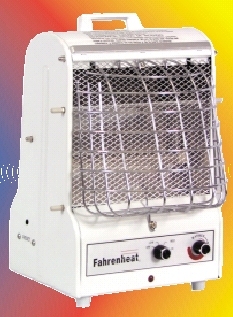 3 Heat Settings define this Q'Mark Portable Utility heater, model number MCM1503. It can be on the radiant setting (no fan) resulting in 600 watt output or on the fan on setting for 900 watt output or the radiant AND fan on setting for a total of 1500 watts of heating capacity. The Q'Mark MCM1503 comes with a cord and plug, chromed safety grill, automatic thermostat, tip over switch and thermal limit. The heater is UL listed. The Q'Mark part number is MCM1503.